There is something about John Cusack that appeals to us all. His face clearly expresses what he is thinking and he so fully embodies his characters that it is hard to Cusack the man from the guys he plays. Girls think he, or his character, is cute, sensitive, funny and destined for something greater. Guys see his characters as who they once were, or are, a guy’s guy, the guy they want to be, the guy girls want in real life. John Cusack is practically his own genre, and who doesn’t love it! The John Cusack genre movie, Better Off Dead, combines the best 80’s teen-angst love story with our favorite sport: skiing. Beth Truss, Amanda Wyss, just dumped Lane Myer, John Cusack, for the more popular ski-team captain. Heart broken and half-heartedly suicidal, Lane determines to ski the unskiable K12 to win her back. As in any great growing up love story, the cute (French foreign exchange student) girl next door is the real gem. Wise, funny, an adept mechanic and a great skier, Monique Junot, played by Diane Franklin, teaches Lane the deeper truth about what is really important. Classic picture-wallpaper obsession, fantastic suicide attempts and imaginary conversations with the girl of his dreams, hysterically depict what so many of us have felt. We empathize with Lane’s embarrassing moments of accidentally expressing outwardly what he was thinking, endearing him to us. His bizarre bathing habits remind us what it was to be a teen. And, don’t we all kind of wish our family was crazy like Lane’s? Lane’s mom, Jenny Myer, played by Kim Darby, is the iconic sweet and oblivious housewife. She absurdly cares for her family with forehead notes, TV dinner Christmas presents and gloppy food that moves on its own, “It's got raisins in it... you like raisins.” She’s the movie mom you can’t stop talking about. Lane is the heartsick adolescent and his brother Badger Myer, Scooter Stevens, is the boy genius. Interposing highly amusing tangents in the story line with an uncanny ability to take any mail scam and make it real, from laser guns to picking up trashy chicks, Badger’s character simply accents the peculiarness of the movie. Ski movies require certain stereotypes and mandatory events to truly be part of the genre, and Better Off Dead complies in its own way. Charles De Mar plays Lane’s best friend, Curtis Armstrong. Like any good sidekick he gives Lane great coaching advice, “Go that way, really fast. If something gets in your way, turn.” And represents the partying characters of other ski movie hits, “this is pure snow. It’s everywhere. Have you any idea what the street value of this mountain is? !” The fun-on-skis montage still excites viewers and inspired future ski movies (Ski School 2). The wipeout scenes are priceless and victory over the K12, on one ski, unforgettable. The geek versus popular, good triumphs all, themes comply with traditional ski movie conflict. Better Off Dead truly is the best ski movie ever, complete with an unskiable run, (accidental) sabotage and big finale race. Better Off Dead is that classic kind of movie that once you’ve seen it, you fondly refer to it too often, and anticipate each scene every time you watch it. 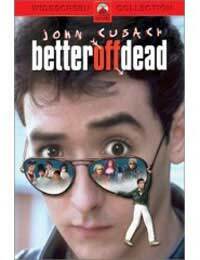 Quotable and ridiculous, yet honest and sincere, Better Off Dead belongs in every movie collection.